There are many issues to be discussed in relation to the upcoming general election, from the economy to education to healthcare, but what about those who can’t express their opinions on what changes they would like to see and how the government could better cater to their needs? The campaign calls on the public to ask them the question “does this seem fair to you?” They highlight everyday difficulties endured by individuals who have disabilities, from using public transport, seeking an education, finding a job, and keeping warm in a safe setting. 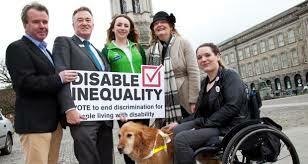 People who have experienced inequality as a direct result of disability are being urged to submit their stories via the website disableinequality.ie. This is in an effort to show political leaders and election candidates that they must endeavour to create a fairer place to live and end discrimination against those who may feel like outsiders in society. Through demonstrating the daily discrimminations dealt with by people with disablities, it is hoped that a great difference can and will be made. Some of which, according to the website, include 24 hours notice needed when a wheelchair user wishes to travel by train, denial of enrolment to local schools because of lack of necessary supports, difficulties living on the level of income they receive and trouble finding employment due to lack of resources and training. A multitude of personal accounts and examples of daily difficulties have been submitted and uploaded to the site. Many highlight trouble accessing public amenities such as shopping centres, supermarkets, social meet-up points and, of course, using public transport independently. Another worry for many who chose to share their story is struggling to make ends meet and afford to live with medications, doctor’s visits and other individual needs. Many others tell tales of how they have little or no access to supports such as PA’s, carers and SNA’s, despite deeming it a necessity, which is down to lack of government resources and the fact that the individual with a disability certainly cannot afford to pay for private homecare or otherwise. The campaign seeks to get all voices heard, one story at a time, calling on anyone who has been affected by inequality to come forward.